Some of the amazing artefacts uncovered by Coventry’s Phoenix Initiative will be seen on television this week when Time Team screens its latest visit to the city. Tony Robinson, Mick Aston and Phil Harding all paid a return visit to Coventry last month to see the latest finds in the archaeological dig in the city centre. So many things have been found that the film crew took enough footage to add 30 minutes more to the original programme screened last year. 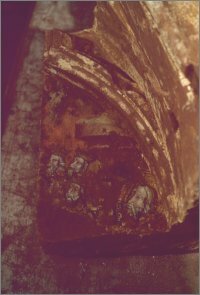 The latest discoveries, including one of the best examples of a medieval wall painting found in this country, will be shown on Thursday on Channel Four at 9pm. The ruins are from the Benedictine priory, founded by Lady Godiva, and demolished under orders from Henry VIII during the reformation. It was the only cathedral in the country to be razed to the ground, but much of the undercroft has survived. Rubbish from the main part of the building fell down the hill and filled the undercroft up. 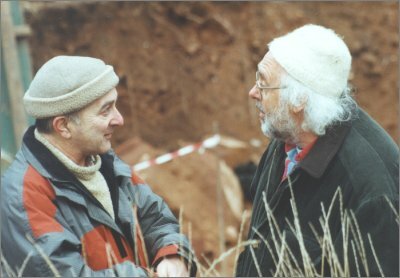 Coventry is only the second site to be re-visited by the Time Team, and was the only place where filming was extended to four days instead of the usual three. "If somebody didn't know what Coventry's first cathedral and priory was, then there is no excuse after 8 March. “The Time Team programme is a way of showcasing our recent discoveries to as many people as possible. “The coverage will mix twenty minutes of the previous programme with thirty minutes of entirely new film. “We hope, however, to reveal some of the magnificent monastic archaeology permanently as part of the next stage of the Phoenix Initiative." The next phase of the Phoenix Initiative project to be completed will be the opening of the Priory Gardens and Cloisters alongside the new Interpretation Centre in April this year. "The Phoenix Initiative is clearly very exciting to those interested in the city's history and heritage. "When the complete project is finished by Autumn 2002, the sheer scale, scope and size of the development, stretching from the Cathedral Quarter all the way down to the Garden of International Friendship by White Street, will become apparent and help create a walkway of 1,000 years of history. “I'm sure the site will then generate even more interest and coverage both locally and nationally."